In this special edition of the Visionary, we focus on love and marriage. We bring you three stories with some great ideas on weddings since February 14th is a popular day to perform a ceremony. Share with us your favorite wedding stories in the comments section for these articles. On Valentine's Day, we want you to know that even if you don't have a "special someone," you are loved, and you have a family here at the Universal Life Church. Actress and singer Queen Latifah added one more title to her list of accomplishments. She is now a certified wedding officiant! Latifah joined 33 couples together in a wedding ceremony at the Grammy Awards during a performance by Macklemore of his song "Same-Love." Couples were of different races, orientations, ages, beliefs, and backgrounds, but united together in equality and matrimony. Award shows may not be a favorite for everyone, but this wedding created a very touching moment. One couple and their ULC wedding officiant decided that - instead of inviting guests to their wedding - they would bring the wedding to the guests. They set out from Seattle and held several interfaith ceremonies around the country. What a fun and thoughtful way to make sure all your loved ones get to participate. What do you think? Check out the article and share your thoughts. That's right, robots are all the rage now. Check out the article for more details. "Love is patient, love is kind..." As we celebrate love this Valentine's Day, remember that a key virtue of any loving relationship is patience. This week's sermon will teach you about the virtue of patience, and how you can practice it in your daily life to become a better, more tolerant person. Click hear to read this week's sermon. 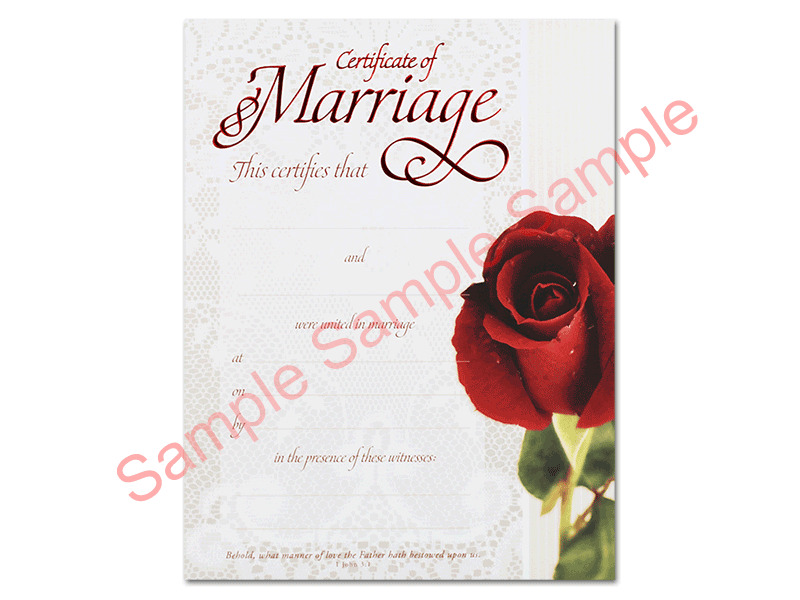 This attractive certificate makes a wonderful keepsake for any newly married couple. 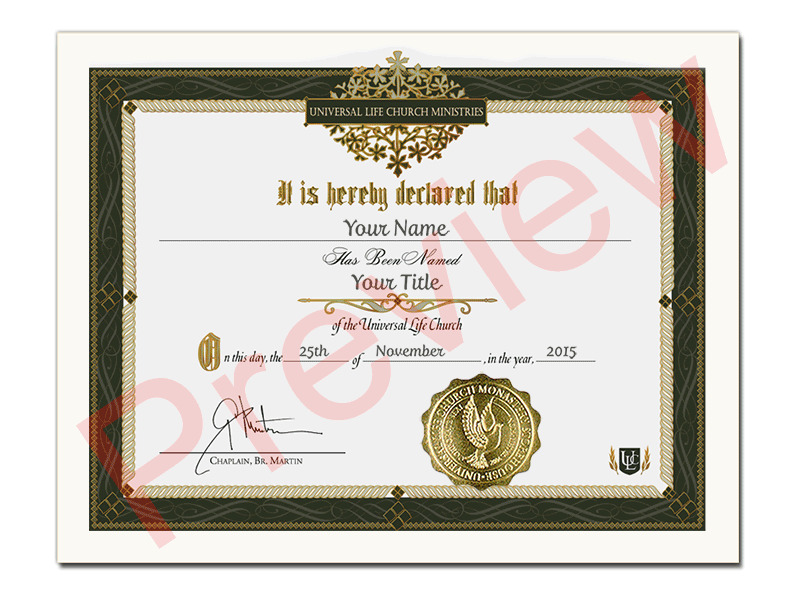 It's the perfect size for framing and hanging, or placing in a scrapbook alongside your wedding photos. Not your style? We have several others to choose from! Please Take This Short Survey - Help a Student With His Research. Dusty Hoesly, a fellow ULC Minister and a graduate student at the University of California, Santa Barbara, is conducting a survey for his dissertation research on the Universal Life Church. If you've been ordained by the ULC or married by a ULC minister, we encourage you to take the survey. The survey is entirely secure, anonymous, and should only take 15-20 minutes to complete. If you can't do it now, please give yourself a reminder so you remember to do it later!